When it comes to SEO content might be one of the biggest factors that determine a website’s search page ranking – however as with all web development, it is the little things that matter too, including your heading tags. A heading tag’s primary function is to divide a document. The headlines of headings are there to indicate what the website content is about. The H1 heading is the primary heading and subsequent heading such as H2 headings serve as by-lines for the H1 heading. It is important not to overload the website with heading tags, as this goes against the premise of natural and organic content on a web page. The H1 heading tag on a website has SEO weight, and search engine robots pay attention to unnecessary repetition thereof. Search engine robots rely on heading tags to tell them which words on a website are the most important, and therefore they should be used as keywords when it to comes SEO. Beside the SEO benefits heading tags are useful when it comes to providing your web pages with an outline. 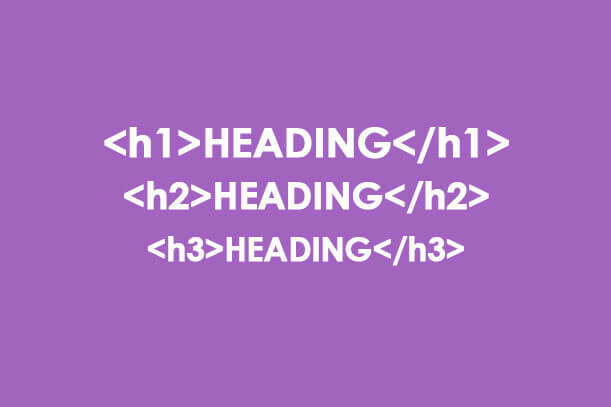 Using heading tags, the layout of a website can be properly structured and information can be organized efficiently from most important topics to least important. When creating a heading tag it is important to remember that it needs to be unique and specifically related to the content of the website. This means that although it should be about the content, the specific wording and word order of the heading tag should not be repeated in the rest of the website content. The more varied your heading tags are the more search engine robots will pay attention to the different pages – as soon as two pages have the same two heading tags, one of them will be ignored, and you lose valuable SEO weight.